This circuit designed to provide a very high gain for the reflected faint ultrasonic frequency signals detected by the ultrasonic transducer and Its working on frequency of 40khz. This circuit can be used in exhibitions to switch on prerecorded audio/video messages automatically when a visitor evincing interest in a product comes near an exhibited product. The above figure shows the transmitter circuit and comprises CMOS timer IC 7555 (IC1) configured as an astable multivibrator, which may be tuned to the frequency of the ultrasonic piezoceramic transmitter’s resonant frequency of around 40 kHz using preset VR1. The pair of transistors T1 and T2 is used for driving and buffering the transducer while it draws spikes of current from IC1 circuit to sustain oscillations and thereby avoids any damage. The receiver front-end (below fig) is designed to provide a very high gain for the reflected faint ultrasonic frequency signals detected by the ultrasonic transducer. The amplifiers built around N1 and N2, respectively, provide AC voltage gain of around 80 each. For higher efficiency, you may use single op-amps such as CA3130 or CA3140. When a visitor pauses before a sistor R10 is used to meet this requirement. The filter also helps to bypass brief bursts of ambient noise in the ultrasonic range. The third stage comprising N3 works as a comparator to provide a triggering pulse when a visitor stops by. This pulse can be used to trigger a timer or a monostable, whose output may then be used to switch on the audio/video message concerning the product for a predetermined period. When somebody comes in front of the ultrasonic piezoceramic transducer pair, the status LED (LED1) glows because of the signal reflected from the body of the visitor. The circuit can be assembled on any general-purpose PCB. 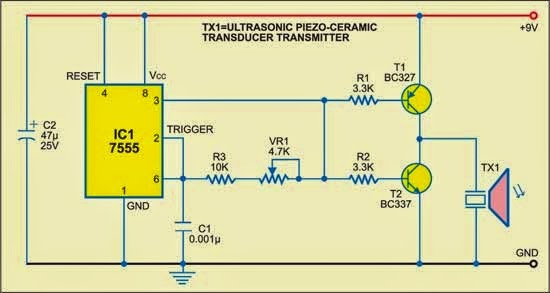 The transmitter and the receiver should be aligned such that the transmitted ultrasonic signal is optimally received by the receiver after reflection. 0 Response to "Ultrasonic Proximity Sensor Circuit Using Transducer"